I love falsies, something about them makes your eye shadow looks from 0 – 100 REAL QUICK, but how comes when I apply mine they just don’t look right?! I have been trying to perfect my eye lash game since early last year when I watched ItsMyRayeRaye’s video on how to apply false eye lashes. You see, my problem was initially the fact that my eye lashes were and still are extremely curly, now this isn’t something I’m complaining about, I love my eye lashes but I also want a more dramatic look at times. With curly lashes applying falsies is near impossible as they are unable to lay properly, so what I have to do to apply falsies is straighten out my lashes beforehand with an eye lash curler (use it upside down and it does the opposite job) as this makes application a lot easier. What also makes application easier is a really good lash glue. I used to use the Revlon lash glue which was pretty amazing but it made my eyes water like crazy so I’ve changed up and now I use the little glue that came in my Eyelure kit which is great for me – no watery eyes. So I have the application down and the glue – so what’s the issue Natalie? Falsies just look completely off on me! For some reason one lash looks different to the other on each eye, it drives me crazy! One sits flat whilst the other tends to sit upwards, don’t ask me how it happens, I apply them the same way and each time, one is determined to move onward and upwards! After all of this, I STILL buy lashes! I’m determined to conquer this! 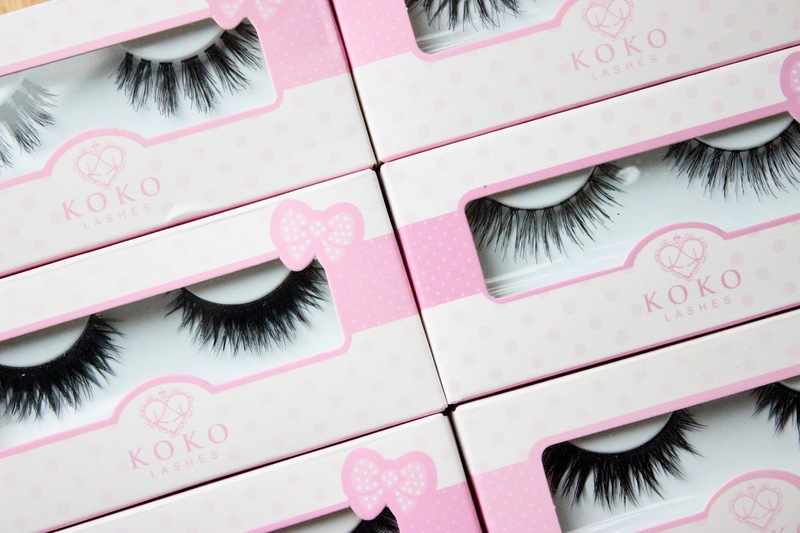 I ordered a few lashes from Koko lashes from Lady Moss as they look amazing – especially the infamous Goddess lashes! I’ve already tried on Misha – I looked crazy guys, they looked so dramatic and they flick up a noticeable bit. Is it possible that lashes are just too long for me? I’m asking for your help!! Send me all your falsie tips and tricks! What never fails for you and has your lashes looking the bomb.com – let me know! Let me upgrade from eye lash novice to veteran in the game! I only wear falsies occasionally but I think I've finally mastered them and the trick is to let your glue dry for much longer than the 30 secs people usually say. The tackier the glue, the fewer mistakes I tend to make. Also, to get the lashes to look the same, I usually push down on the tops of them before they dry completely. This makes sure they look flatter rather than the one up, one down problem you described. Don't give up though! Nana! Thank you, I've been letting the glue dry longer and trying the push down method which really helped the other day!! I am the same! Then I end up getting glue everywhere! I'm letting them get tacky for a lot longer now, those YouTuber lie, about 30 seconds or so, whatever! Lol! You're right, I do need to keep on practicing! I wore Foxy out the other day and I fell in love with them! They really vamp up the look. Haha! Sorcery!!! You just buy regular eye lash curlers but use them upside down, this straightens out your lashes making application a lot easier! Check the link for the video in the post for more info!